Ask any kind of question to Aleu....HERE! Hey Alue Where did you lead the clan after you left? Aleu: Just wherever the ice block lead us! We just howled and we got tired and went to sleep. Then the next moring, we landed on the island of the caribu! Do you ever miss kodi and your parents being so far away? 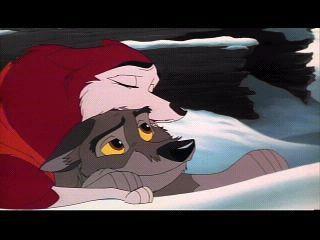 Aleu: I've never met Kodi, becuase I was always in the wilderness playing with Muk and Luk so I've never seen him. But since he's part of the family i miss everyone there. yea i figured that you would. How is it living with a pack of wolves? Aleu, do you ever visit or plan to visit your family again? Baltofan123--> Aleu: I feel secure and safe. They are a great group to lean on if I'm hurt; metaphorictly speacking. Midnight_12--> Aleu: Yes, I do. until the next season, I'll lead the carobu and my pack back to the other side and see my family agian. If the ice blcocks don't come back, then I'll visit them in my dreams. Hey alue are you eve going to visit your parents again? Aleu, do you have a crush on anyone? hey alue what is it like living with wolves? Fire>>>>Yes, hopefully someday I will. Midnight>>>>No, not yet. It's a little too early for me. Fire>>>>It feels great living with the ones like me. Even though I'm not a wolf 100% in blood, I am in heart and mind. Hey Alue what is your favorite thing to do? In the pack, I love caring for all the wolves and getting to know them. When I was in Nome, I loved pouning and outwitting my siblings.